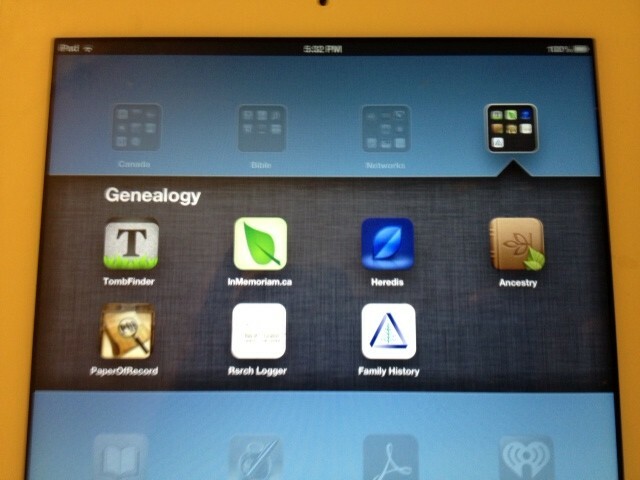 Besides the many online websites for genealogy searching, there are a growing number of great applications for iPads and iPhones worth a try … and the price is right: most of them are free. Have part of your tree in Australia? The New South Wales government has an app for that! Called Family History, it allows a search of the database of the Registry of Births, Deaths and Marriages. Free. InMemoriam.ca has a great app for obituaries of recent vintage (the last 25 years or so). Covers most provinces, though notably not Ontario. Free. Research Logger is a place to store your research notes on your phone or pad while at a library or archives. Free. TombFinder is one of several (including 1BGraves also free) that offer photos of gravestones. While not quite the equal of the online sites, these apps do provide the opportunity for you to easily contribute photos and cemetery listings… whether just your own family’s stone or those for a row or section of a cemetery. Neat feature: TombFinder uses GPS data when photos are uploaded, so it can offer precise driving and “walking” directions right to a particular stone. Free. PaperOfRecord is an app with a price ($4.99) but can be just the destination if there is a particular historic newspaper you need to research. Hint: Check the list before signing up, to avoid disappointment. Some early papers I’ve used .. limited run of dates .. include the Bytown Gazette (1836-1845), Ottawa Free Press (1871-1881), Ottawa Times (1865-1867). I will admit I like the website best, but the iPad app is really a great research helper when not at the desk. A search engine like Google or Bing … but just for genealogy sites and databases. That’s Mocavo. I have not found it especially useful myself, but many have found it helpful and it does have the ability to save and repeat searches. 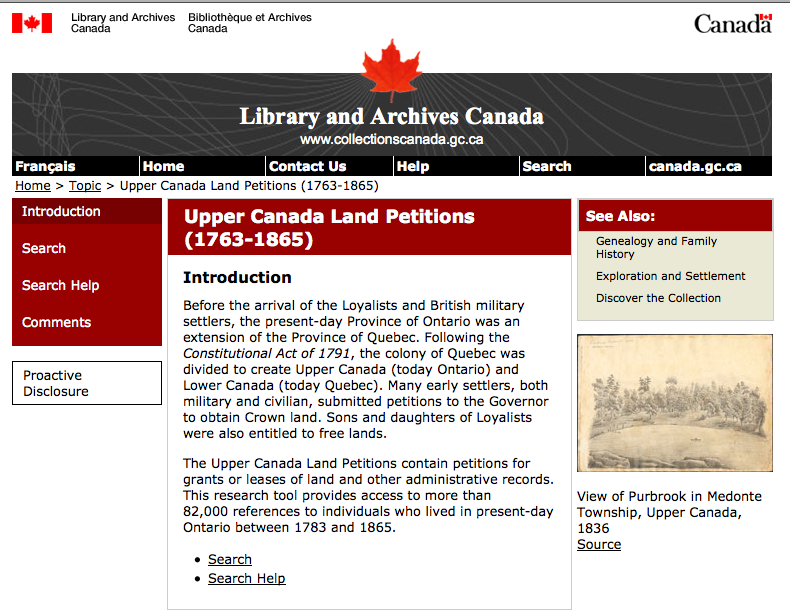 While it is old news that Library and Archives Canada put the index to the Upper Canada Land Petitions (1763-1865) online … it seems to be fairly unknown that LAC has also put online the digitized images of the petitions (Sept. 2010). The reason: there is no connection between the index here and the digitized images. When you search for your person, you’ll locate the microfilm you need — the number of the microfilm the petition information is on. Use it to find the digital images and click through them by starting here. Some of your challenges: 1. Not finding your petitioner in the index! It seems that there is something to be desired in the transcribing of the index. Try different versions of the name — Jeremiah O’Connor, Jeremiah Connor, J Connor, J O’Connor. 2. Finding your person! You’ll have to make your way through the whole microfilm to locate the page image you need. Mary Catherine Moran describes how she found her James Moran. So, for example, the index entry for James Morin of Huntley indicates that C-2739 is the relevant microfilm number. … I found Denis Killeen and James Morin [Moran] on page 545 of 1129 pages. So, yeah, I did have to do some clicking around to find the relevant page. As usual, when faced with 1000 or more pages of text, I used my ‘by the 100s, then 50s, then 10s’ rule: I start on page 1 (yes, brilliant is my method, I think I should take out a patent or something), then go to page 100, then 200, 300, 400, and so on. Once I see that I’ve gone too far, I go back in 50-page increments, then refine with 10s, then finally zero in on the looked-for page. But that probably makes it sound more complicated than it actually is: took me less than 15 minutes to find James Morin [Moran] in the online version of microfilm C-2739, after looking him up in the online index. And that’s about three or four weeks faster than the previous photocopy ordering system. Advantage: internet!